When Matt Grevers jumped into the pool prior to this last weekend's 100-meter backstroke at the Missouri Grand Prix, he had diamond on his mind, not gold. The two-time gold medalist had concocted an elaborate plan to propose to his longtime girlfriend, fellow national-team swimmer Annie Chandler, atop the medal stand. All he had to do was get there. "I've just been searching for a unique way to pop the question," Grevers told reporters. "My whole family is here and I figured it would be a perfect opportunity and a unique situation." 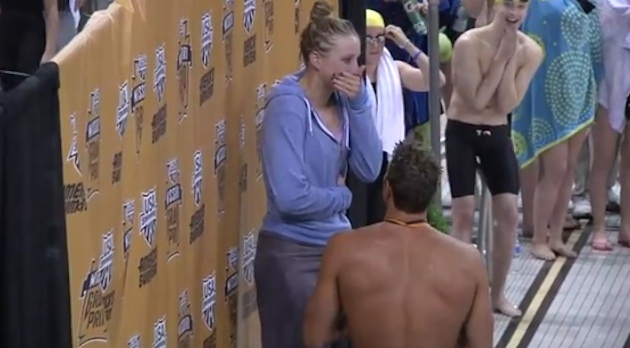 Originally, Grevers had hoped to propose while Chandler was on the medal stand. A fifth-place performance in Friday's 100 breaststroke scuttled those plans. He didn't want to do it on Sunday, so his plans were all riding on Saturday's backstroke race. "I took [the race] out a little fast because my heart was racing the whole time," he said. "If I didn't get first it wouldn't have worked out so well." 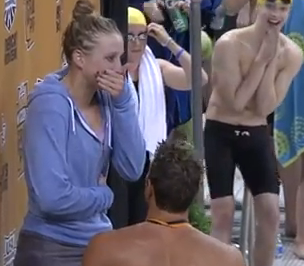 Grevers' brother, Andy, is an assistant swim coach at the University of Missouri (where the event was held) and played a key role in the proposal. He held the ring during the race and surreptitiously passed it to his brother afterward. The couple didn't talk about potential wedding dates, though late July probably won't be in the cards. The 2012 London Olympics begin on the 27th of that month. Grevers and Chandler hope they'll both be competing.